Recently, I came across an online video of troop movement along Howard Cooke Boulevard in Montego Bay. It was a massive show of force by the military, a sight to behold. It was reminiscent of haunting and disturbing images from other third world countries in the throes of a military coup. 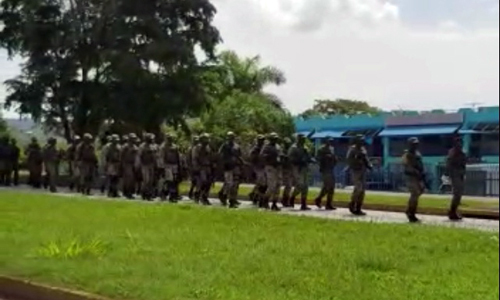 Had this overwhelming display of military might taken place in the heart of Kingston, rather than Montego Bay, where there is an ongoing State of Emergency, I would have surmised that the military was becoming quite restive in the face of low pay, the mounting crime problems/unchecked murders and general disorder bordering on anarchy. The military is aware of the high esteem in which they are held by the Jamaican people, therefore, it is not so farfetched to believe that the Jamaican army cannot and would not launch a coup against this or any other government which they deem corrupt and cannot guarantee the Jamaican citizenry peace and security. The military also understands that the Jamaican people, cowed by the murderers amongst us, would gladly embrace them as recent polls have indicated. According to a January 2017 United States Agency for International Development (USAID) survey of 1,515 Jamaicans, 56.4 percent of those polled would conditionally support a military coup in Jamaica. What might forestall such an eventuality is the military’s continued adherence to the principles of democracy and fair play. I say continued adherence because, at the height of the Dudus standoff, November 2009, I had an interesting conversation with three Jamaica watchers. Those men represented powerful governments who all had vested interests in the resolution of the impasse sparked by the Bruce Golding administration’s refusal to turn over Christopher ‘Dudus’ Coke to the Americans to face criminal charges there. Peeved at Golding’s stonewalling and further incensed by his bold assertion that ‘Jamaica’s constitutional rights do not begin at Liguanea’ comment, they clearly wanted the military to overthrow the Golding administration, however, to a man, they all agreed that the military’s leadership and core values were too steeped or entrenched in democratic principles and adherence for that to become a reality. The Jamaica Defence Force might be a different entity than that which obtained in 2009; its leadership has certainly changed over the last nine years. Let us, as Jamaicans, even those who are content with giving up some constitutional rights, hope that the principle of democracy still underpins the J.D.F. Despite that hope, it is disturbing that such a high percentage of Jamaicans would support military rule. Alarming though is the progression or hankering for military rule over an eleven-year period. In 2006, 39.7 percent of Jamaicans said they would support a military coup. In 2014, that percentage rose to 49.2 percent, jumping to the current 56.4 percent. That’s a 7.2 percent jump in two years compared to the 16.7 percent over the eleven-year span. Obviously, in less than eleven years, the majority of Jamaicans have lost confidence in the Jamaica Constabulary Force’s ability to protect and serve us. To that significant 56.4 percent, I say Caveat emptor; this is a Latin term that means “let the buyer beware.” Military rule might not be the answer. Military rule might fail to meet your expectations. To opt for military rather than democratic rule is an extremely dangerous proposition which would irrevocably change the perception of Jamaica in the eyes of the world community. There are lessons to be learnt from gladly embracing military dictatorships with open arms throughout the years, but one of my favourite is that of General Napoleon Bonaparte and the people of Milan, Italy. On May 5, 1796, he entered Milan as a victor and saviour. The Milanese greeted him as a heroic liberator, the general who freed them from the rule of the Austrian emperor Francis I. Who is to say that if we were to experience a military coup in Jamaica, the junta would know when to return the reins of governance to civilian rule? How would such a move impact the financial organs of government? How would it impact public service and production? Be warned, a military coup is fascism, an often brutal model of efficient government, replete with staggering poverty and corruption. The stage is set for fascism or military tyranny, whichever pill that 56.4 percent of pro coup Jamaicans wishes to swallow when that time comes. You gave the military broad public support, the greater the support, the greater the power. The greater the power, the more brutally it will be wielded.